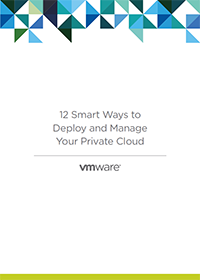 VMware vCloud Suite can dramatically improve efficiency, agility, and control for IT organizations. Download this eBook to find out how to implement it and see results in your business. The cloud continues to be a force to be reckoned with and many companies benefit from its speed of access and time-reduction capability. Although the challenges of high implementation costs, difficulty of integrating with existing infrastructure and data security are some reasons why companies steer away from using a private cloud system.